We all know about the battle against censorship. We all know the importance of free speech. My publisher supports this battle all year long, but this is a special week in which to shout from the rooftops and draw lines in the sand. Imagine if the censors had their way throughout the years. There'd be no ARE YOU THERE GOD, IT'S ME MARGARET by Judy Blume, or THE GIVER, by Lois Lowry, or THE CHOCOLATE WAR by Robert Cormier or A DAY NO PIGS WOULD DIE by Robert Peck. Countless others. Some people even wanted to ban HARRY POTTER, which is the silliest silliness in the history of silly silliness. Please spread the word that we can never let ourselves take the first step on that treacherous slippery slope. Check out this website by the Random House First Amendment Committee: CLICK HERE. 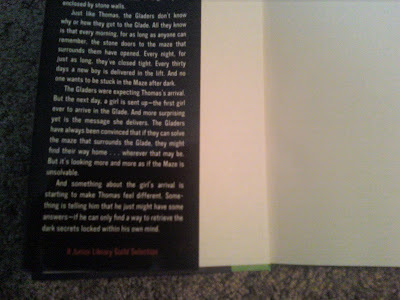 I love the part where you can read quotes from authors like Judy Blume and Lois Lowry about censorship. Have a great day. I'll return to my normal giddy ranting about how close we are to my release day soon. Just a quick post to say that The Book Academy conference was truly amazing yesterday. Over 300 attendees and very well organized. My favorite part was Brandon Sanderson's keynote address. I had a lot of fun serving on a panel and teaching a class, too. Kudos to the folks at UVU! Also, THE MAZE RUNNER had a great article about it in Publisher's Weekly yesterday. To read it, CLICK HERE. My sincere thanks to Shannon O'Connor at Doylestown Bookshop in Pennsylvania. 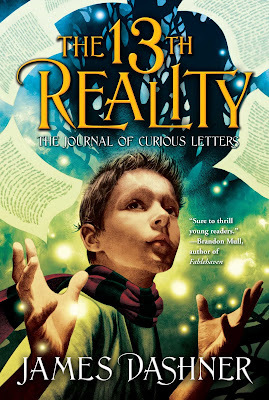 If you missed the new cover for The 13th Reality paperback, CLICK HERE. Eleven days to Oct. 6. Eleven days. Can't wait for single digits! Why can't it be mine? I wanted to show everyone this awesome cover by John Picacio for the paperback of Book 1, to be released December 22, 2009 by Aladdin (an imprint of Simon & Schuster). I really love it! Simon & Schuster purchased the paperback rights to the series, so it's now a joint venture. They made the decision to publish the PBs with different covers, but keep the incredible inside illustrations by Bryan Beus. Yeah, I'm sure you have that memorized now. Would've been a lot easier to say they'll come out every April till it's done. Anyway, if you end up liking MAZE, I think you'll like this other series of mine. It's full of mystery, riddles, action, other realities, futuristic weapons, monsters, teleportation, and things called barrier wands, tingle wraiths, gnat rats, fangen, ragers, shurrics, sleeks - oops, I'm getting into Book 3, better stop. Well, I guess I explained it in more detail than I thought. Maybe I'll just link to this in a month or so for our (hopefully) many new Duders once MAZE comes out. I know it's kind of confusing that I have 2 series going on at the same time, but there you have it. Any questions? In case you missed it on Monday, we got a great review from Publisher's Weekly for MAZE: CLICK HERE to read it. Dashner (the 13th Reality series) offers up a dark and gripping tale of survival set in a world where teenagers fight for their lives on a daily basis. 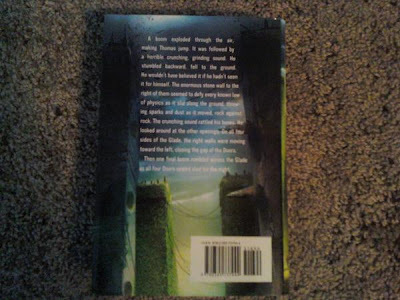 It starts when Thomas, a teenage amnesiac, wakes up in the Glade, a fragile oasis in the middle of an enormous maze. Here, a group of teenage boys eke out a hazardous existence, exploring the Maze by day and retreating to the Glade at night. No one knows how they got there; no one has ever found a way out (“Old life's over, new life's begun. Learn the rules quick,” the group's leader tells Thomas). Bizarre technological monsters called Grievers patrol the Maze's corridors, almost certain death for any who encounter them. Thomas struggles to regain his memories, but the arrival of a young woman with an ominous message changes the rules of the game. You can see it online, too: CLICK HERE. We've had 3 trade reviews now, all extremely positive. I hope you guys agree! 1. The Falcons are 2-0. Yes. 2. I had an awesome time at the LUW Roundup conference, and I'm looking forward to the Book Academy conference this Thursday at UVU. 3. We had another foreign rights sale: Spanish (North and Latin America). Yes! Spanish! I'm really, really excited about this one. 4. You can see all the details of my upcoming tour for MAZE by clicking HERE. I really hope to meet a lot of you - come see me!!! 5. Two weeks to release day. Two weeks. TWO WEEKS! I have a small concern. I've been reading many of the advance reader reviews on the internet (something Sara Zarr keeps telling me to NOT do) and I'm really surprised at how some of them are chock full of spoilers. A few are even telling things that happen clear up to the very end. 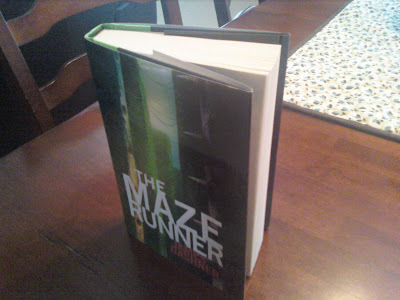 THE MAZE RUNNER depends heavily on surprise and intrigue. So... two things. Please put SPOILER ALERT before you spill the beans on significant plot points, and for those of you waiting to read it, please don't read the spoilers! I promise your experience reading this book will be so much better if you know little going in. I don't know, is this a reasonable concern? I'm very thankful for the reviews and the time that went into them. Very much so. Especially you awesome bloggers out there (most of whom are totally great on warning about spoilers). I just want readers to have the best experience possible, and if you know certain things, the book might be ruined. In my opinion. 1. Okay, the winner of the forum thingy from my last post is Alysa. (Congrats!) So now I owe books to Jenn, LouMac, and Alysa. Make sure I have your address (email addy is in last post). Also, I'm waiting to see if they have more ARCs. If not, then you'll just have to get a hardback I guess. 2. If you missed the thing about the forum, go over to http://www.randombuzzers.com/ and sign up. I'll be doing official chats over there starting on Sept. 28th. 3. We are 17 days and 21 hours away from the release! Roughly. 4. My full tour schedule is up on the new website, http://www.themazerunner.com/. I'll be coming to 8 cities, and I hope to see many of you while out and about. Just click on the author section to see the tour details. 5. If you haven't played the game on there yet, do it! Even the great Shannon Hale got addicted to it and ignored her children. Serious, they were taken by the state child services just last night. Isn't that awesome? 7. I'm off to the LUW writer's conference at the Homestead in the mountains for 2 days. It's gonna be fun - I get to MC the awards dinner. Let's hope I don't make a fool of myself. 8. Everyone have a wonderful weekend! Okay, for months we've been toying with the idea of making a forum for all the faithful Duders. Well, we finally have our chance! Random House has their own forum website for its young adult authors, so this works out perfect. It's called Random Buzzers. aka www.randombuzzers.com. There are a couple of links for my stuff on the main page. CLICK HERE to go to the section for my name. (You have to join and login before you can do anything.) I figure this will be a great testing ground to see if a forum is worth the effort. Duders, don't let me down! If you join, please leave a comment telling us your user name, and I'll give away a book or two. That reminds me - Jenn, I know I owe you a book! And I never announced the winner from those of you who left silly comments over at Aprilynne's blog contest for my book. The winner is... LouMac!!! Please email me, dashnerjames, gmail. By the way, if you missed it, please go and check out the official website (www.themazerunner.com), which just went live on Friday. The online game is so awesome and addicting. Let us know in the comments if you're able to achieve all ten missions! Be sure and go to the "join the discussion" link because they're giving away 5 ARCs. Also, they have the entire tour date schedule up. And you HAVE to play the online game. It's amazing! Wow, I am just blown away. THANK YOU RANDOM HOUSE!!!!! 1. I finished the first draft of THE BLADE OF SHATTERED HOPE, Book 3 of THE 13TH REALITY. It clocked in at 97,230 words, 63 chapters, and lots of coolness, death and mayhem. Now for editing..... Bleck!!! 2. My agency sold rights to THE MAZE RUNNER trilogy in Brazil. Publisher: V&R Editora. We're really excited to have such a positive review! WARNING: Major Spoiler Alert!!! If you don't want to read the synopsis part, scroll down and I'll post the last couple of lines only. Here are some pics. Notice the front flap says "A Junior Library Guild Selection." Did I ever tell you guys about that? I can't remember. 1. 33 days. The Double Triple. Eleven Times Three. Ye Olde Thrice Thrice. It's coming! 2. Good friend and fellow author Aprilynne Pike (WINGS, being made into a movie by freaking Disney with freaking Miley Cyrus!) 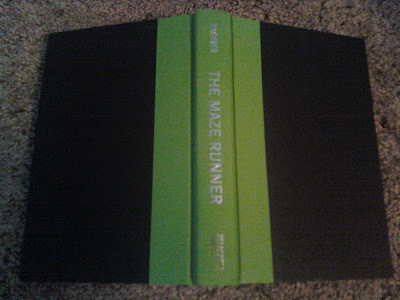 is being so kind as to give away a signed copy of THE MAZE RUNNER on her blog. To enter, you only have to comment (about anything!) on her blog. 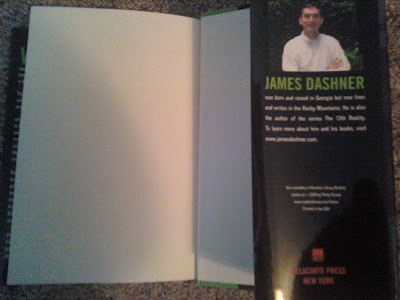 We should have code words to show who made it over there via The Dashner Dude. Hmmmm. Since Aprilynne is a friend and understands my idiotic sense of humor, let's do this: Say what you want in her comments, but sign off by saying something absurdly ridiculous and silly, like, "Wee Willie Winkie had a stinky pinky." Come on, be brave! Anyone who does it will be entered into my own contest for another copy of MAZE. To visit her blog, CLICK HERE. The contest is open through Labor Day weekend. 3. Now, I'm pretty sure nobody's gonna classify MAZE as a romance anytime soon, but luckily The Romantic Times has a broad vision of books they like. In our very first trade review, we couldn't be more pleased! They made MAZE a "Top Pick" for October and did a really nice feature, including an interview with me. Look for it on magazine shelves at your local bookstore or library. Thank you RT!!!!! 4. I'm very, very, very close to completing the first draft of Book 3 of THE 13TH REALITY. It may even happen today. Or tomorrow. I'll definitely tweet about it when that happens, and probably update this blog post. That's always an exciting moment in which my wife and I celebrate by running naked through the park and tackling old ladies. If you'd like to join us, give me a call. My number: 555-555-5553. 5. College football starts tonight. Pro football starts a week from tonight. Georgia is ranked #11, the Falcons should build on their playoff season from a year ago. And there was much rejoicing. 6. Have a wonderful weekend! Why can't we have unhurried hearts? To beat in time with our stops and our starts. To keep the time when things fall apart. It's the best for a lot of reasons: It begins my favorite time of year, the four months of Sept-Dec. It's the official unoffical beginning of Autumn, Football, Crisp Air, Leaves Changing, Halloween, Thanksgiving, My Birthday, Christmas (or your respective Holiday), New Years, Snow, Skiing, etc. And now, of course, I have another awesome thing to add to Fall (at least for the next 3 years): the release of a book! 3. 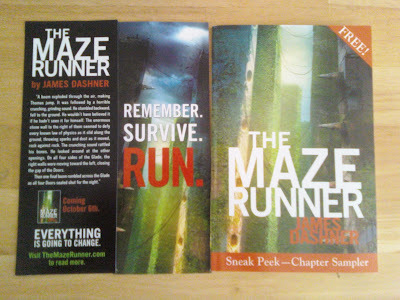 Today also marks exactly FIVE weeks until the release date of my very own book, THE MAZE RUNNER. For those of you scratching your heads trying to do the math, that also equals 35 days. It's also equal to 3.5 Decadays, a term I'm pretty certain I just made up. Epiphany: it's also exactly one half of a Decaweek! How cool is that? 4. I had a really awesome experience this past Saturday - participating in the 2nd annual Writing for Charity event in Ogden, UT. We had a lot of people show up and raised $8,000, which will go to the Treehouse Museum (am I the only idiot on Earth who forgets what order the "e" and "u" go in that stupid word?) and to put books in the hands of needy children. 5. Evidently I AM the only person on Planet Earth and The Solar System and The Galaxy that didn't know what the word "docent" meant. I was ridiculed and spat upon by the other authors for said ignorance. 6. At dinner afterward, I had the singular pleasure of being forced to pay for Brandon Mull's dinner because he "forgot his wallet." I only tell you this to embarrass him. 8. 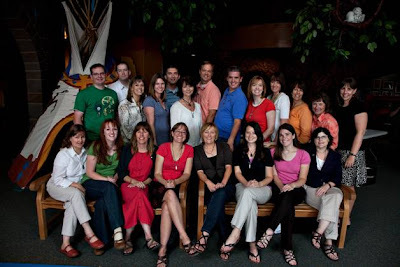 Here's a picture of the participating authors, all of whom volunteered their time. The person who can name the most authors in the picture gets a signed copy of THE MAZE RUNNER. If someone gets them all, the contest ends at that very exact second. 9. I'm smack dab in the middle of writing the climax for Book 3 of THE 13TH REALITY. Right now the book stands at about 90,000 words and I'll probably finish the first draft this week. It has a very strange ending, but I've come to expect that from myself. 10. I think I tweeted this, and maybe I even blogged it, but just in case: I've decided to postpone my ACL surgery until after my release tour (8 cities, schedule coming soon!) so as not to take any chances that complications could ruin the whole thing and make me wallow in misery for the rest of my life. 11. If you haven't followed me on Twitter yet, please do! CLICK HERE. I promise I never mention anything about going to the bathroom. Well, I did once, but it was special circumstances. I'll also never mention the words "Demi" or "Moore". To any god or government. He knows changes aren't permanent. Is what you say about society. Catch the spirit, catch the spit.